I've now been back at work for over three weeks and if I'm honest I'm really loving the balance between home and my career, I feel as though it seems to be just right. I would be a complete liar if I said I didn't dread returning to work this time around and that's no mark on my job, it's just that I was so content and happy at home, I also really worried how Patrick would cope with so much change. It turns out, he's taken to nursery and my nan / mum, like a duck to water - which of course has made my transition back into my role a lot easier. I don't for one second think this is the case for everyone, and I do realise how lucky I am that things have worked out but over for the last month I've realised a few things that definitely made our life easier or harder with the whole transition. It's a huge change for a family when both parents are back in work again, it not only affects the days you are at work but it changes the routine in the ones where you are at home too. Our weekends and evenings are filled with a lot more housework now as I'm not at home in the day to do it, we miss post and have to trundle to the sorting office and if there isn't an evening grocery slot available then I have to head out to the shops, I know it's only little things but when life is pretty hectic - these changes feel so huge. Anyway, more to the tips. I want to try and help any Mums out there, whether it's your first child or fifth, we can always learn something and I hope these will help you as they have us in our transition from maternity leave to back at work. Do a trial run. It sounds stupid and probably the last thing you want to do when you're relishing the last weeks of your maternity leave but you'll thank yourself for it later. Put that alarm on super early, lay the childrens clothes out the night before and head out that door as if you would for work. Even if it means you just potter around the supermarket really early, try to make the commute to work first, check the timings and you might realise 'actually, there are temporary traffic lights there, better set off 10 minutes earlier', there will always be something to learn. Begin the routine early. If your little one is going to a childminder, nursery or even a relative, then start that routine up a little before you really have to. From January we let my Nan have Patrick (and Noah who she always has anyway) one day a week, it meant that for both her and him it was a lot easier now the time has come when she has both boys for two days every week. I don't have to fret as she knows his routine like clockwork. The same goes for Nursery / Childminders, it makes sense to let them have a couple weeks adjusting whilst you are at home. That way, if they are incredibly unsettled, you are right on hand to go and reassure them. This massively helped me, as when I was at work I wasn't worrying (too much anyway) about how Patrick would be settling - as I knew he already was. Prep. I always remember a quote on a wall in high school that read 'Fail to prepare and you prepare to fail' and while I don't think it's 100% true, we better not leave anything to chance ey? I make sure I get as much as I can out the night before, both boys have their bags packed, me and John have our uniform laid out and I even go as far as to pop my coffee in my cup with the sugar, and make sure the kettle has enough water in. It's all trivial but time is precious in the morning, I absolutely despise running late. Plus, who wants to be routing around for black socks or the childrens hat the morning of your return to work? Get the OH to book the day off. If you have the annual leave I think it's helpful, They can do a few bits around the house, ensuring it's all clean and tidy for your return and if you're super lucky they might even cook you tea. Now you can share parental leave, this might be an option if you have some days remaining. Return midweek. Something I actually wish I had done, don't get me wrong my first week went so quick it didn't feel as though it happened. But if you're working a Mon-Friday job like myself, it might be a good idea to return on a Wednesday or Thursday, to ease yourself in slower. 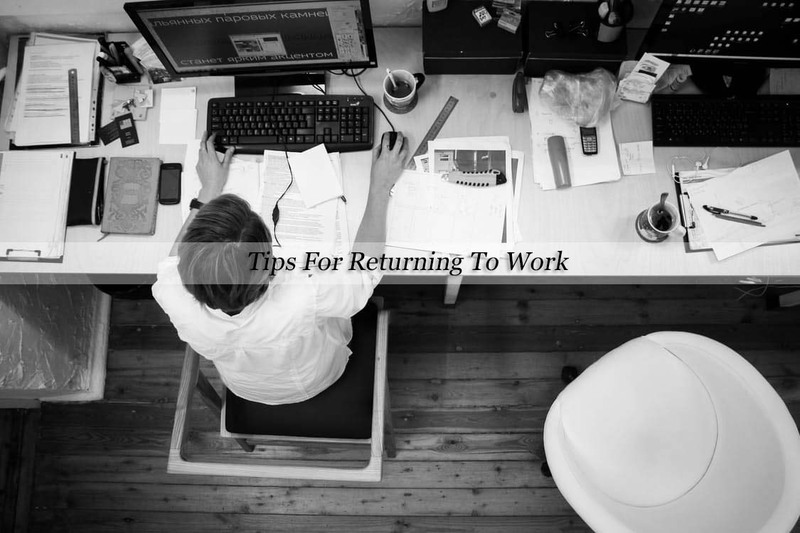 Your return date is entirely up to you, and at least this way you're only working a couple of days before you have the weekend again - it wont feel like you've been thrown in at the deep end so much. My last piece of advice is not to worry, I completely over-worried and I do regret wasting my last couple of weeks of maternity leave up half the night in dread. It's truly surprising how adaptable babies are, and us as mothers. I've spoken a lot about my choice to be a working mum, it's one I'll always stand by and am proud about, it's definitely not easy, I do get exhausted and question myself from time to time, but at the end of the day I know it's what works best for my family. Some great tiips here and I am so glad that it has gone smoothly for you. It was like that for me and ot is good for you and the babes, to have that separation and me time. Oh my goodness these are great tips! I'm pinning this for later, I'm not returning to work before 2018 though, but damn this was a great post. For me, hardest in returning to work is the fact that I really didn't enjoy my job before I stayed on maternity leave so I really don't want to go back there. Some fab tips! I have been fortunate to not have to return to work after my youngest 2 were born but when I had my first it was horrid. I was in the fortunate position to be able to take him with me but I was so apprehensive! Love these tips, I wish I'd got Dave to book the day off... it would've been just what I needed. I thought it would be super stressful but I love my days at work, some times absence really does make the heart grow fonder!